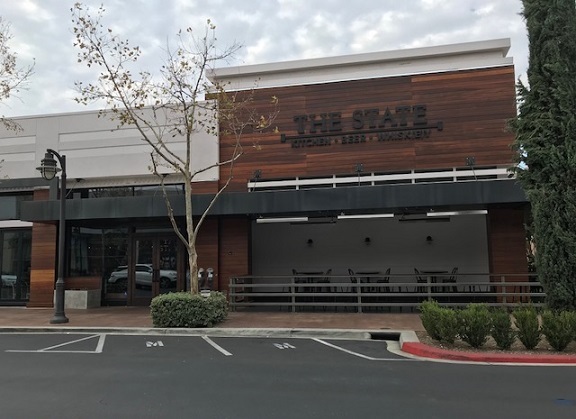 The Redlands gastropub The State (it’s on State Street) has expanded west to Victoria Gardens, where it took over the old Ra Pour space. Three friends and I had lunch there in December. Between the concrete floor and the cranked-up music, one friend said: “My first comment: ‘loud. '” We could hear him, though. And as at that point they were playing such soul oldies as “I’m Your Puppet,” “Try a Little Tenderness” and “Kiss and Say Goodbye,” it wasn’t in me to object. Two got the portabella sandwich ($12), one with a salad as the side (free), the other with fries ($1). Both called it “average.” The bread looks great. 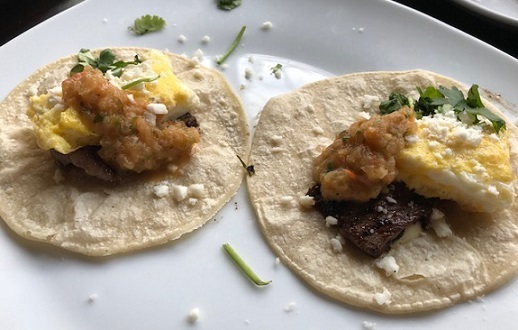 Another got steak and egg tacos ($8), which the server cautioned would be small as a main course. The warming proved accurate, although they were enjoyed. 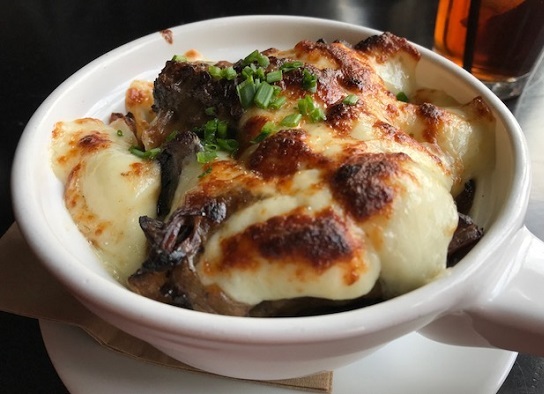 I got the apple harvest salad with chicken ($11 + $4), light and tasty, and some of us shared the poutine ($13), the Canadian comfort food of fries topped with cheese curds, braised short ribs and gravy. That was a real winner. “I would definitely come back” and “delicious” were the comments. Meanwhile, TVs silently played “Casablanca” — easy enough to fill in the dialogue on that — and other old movies or clips. Nice backdrop. The state of The State is strong. 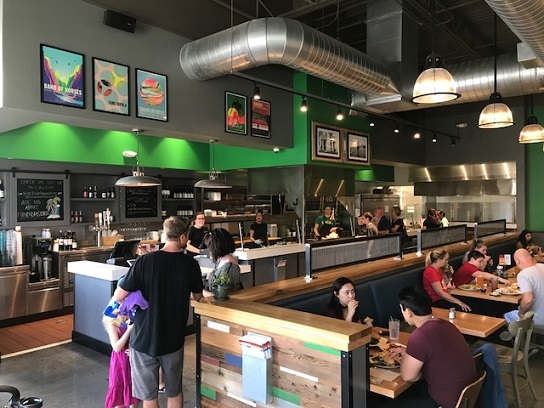 A Pasadena-based hot dog chain, Dog Haus opened over the summer in Victoria Gardens along what we might call the millennial-friendly street with wider sidewalks, benches, charging stations and, increasingly, a more eclectic range of shops and restaurants. 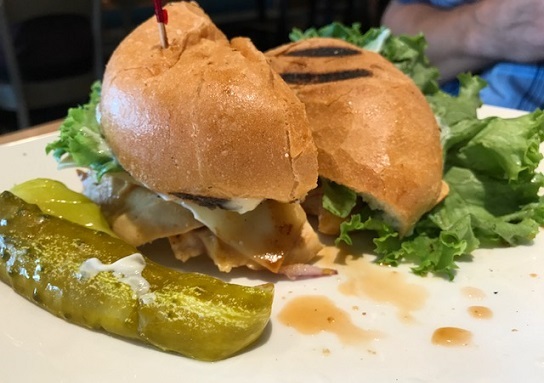 I’ve been to the original location a time or two and had something of a mixed reaction, liking what they were trying to do — quality links without hormones, etc., and on King’s Hawaiian rolls — but not entirely sold on the rolls compared to good ol’ buns. Still, that the chain was opening one out here was welcome, and I was interested in giving it a try again. 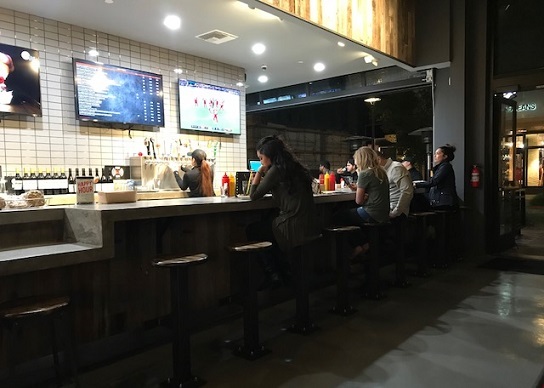 The VG location opens to the sidewalk in decent weather, with a wraparound bar/counter where you can get a local beer (including Claremont Craft Ales, Hamilton Family and Dale Brothers) and the food. 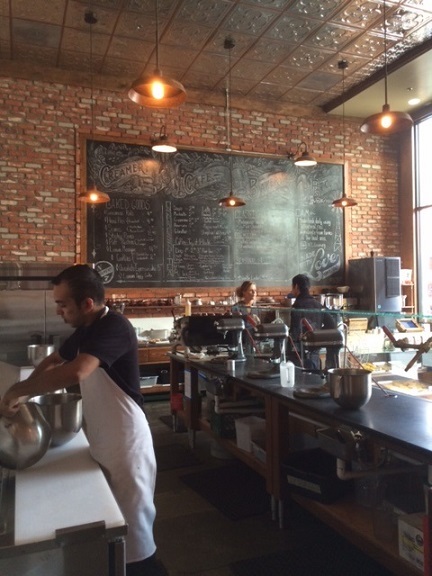 There are also tables, a casual counter and communal seating, all under Edison bulbs. I was there on a warm December evening (remember those?) and the restaurant was comfortable even with the door open and grating up. 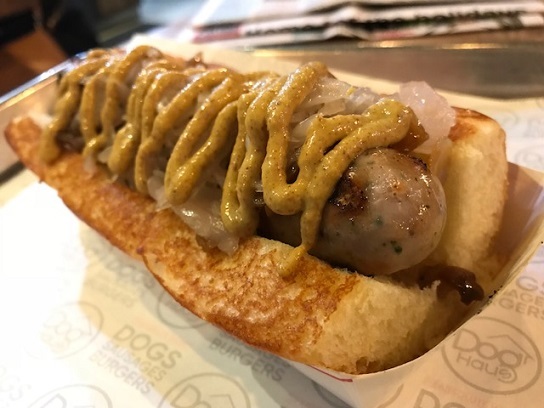 I got the Das Brat ($8), a bratwurst with sauerkraut, onions and mustard. Very good dog, and the roll caught me by surprise, lightly toasted to a sort of buttery perfection. I’ve been back since and the roll was close but not quite as prime. Still, I’m sold. My only beef, ha ha, is that Dog Haus really lays on the mustard, as you can see. It’s a bit much and a bit messy: I’d prefer about half as much, personally. The menu has a few burgers too, plus ice cream from Alhambra favorite Fosselman’s. (Note to whoever handles the website: Don’t say you’re “proudly serving” that brand and then misspell its name.) 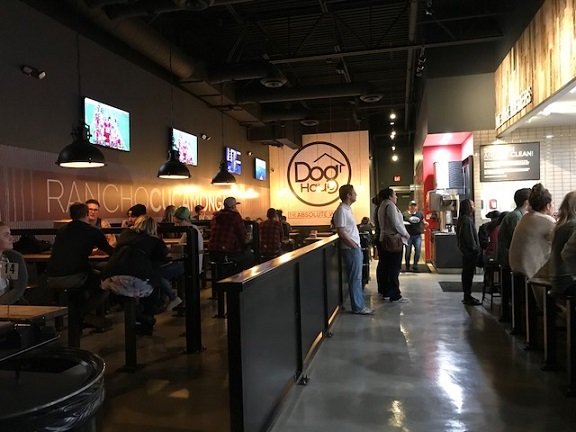 So it’s a limited menu, but Dog Haus sticks to what it does best, and does it pretty well. Victoria Gardens earlier this year gained a Jack’s Urban Eats, a self-described “urban cafeteria” with an emphasis on seasonal vegetables. 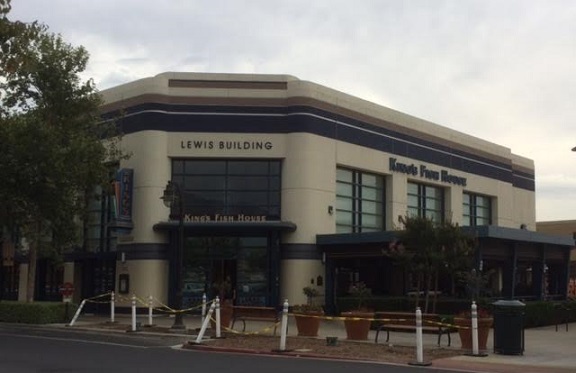 It currently has 14 locations, all in California and most around Sacramento. The closest to us is Fresno. 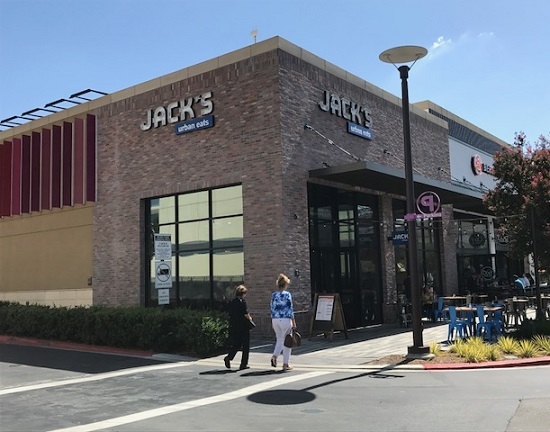 At the mall, it’s just south of King’s Fish House along the street that got a hip makeover a year or so ago, with design-conscious pavers, benches and lights, and which has gradually focused its stores and restaurants to match the feel. 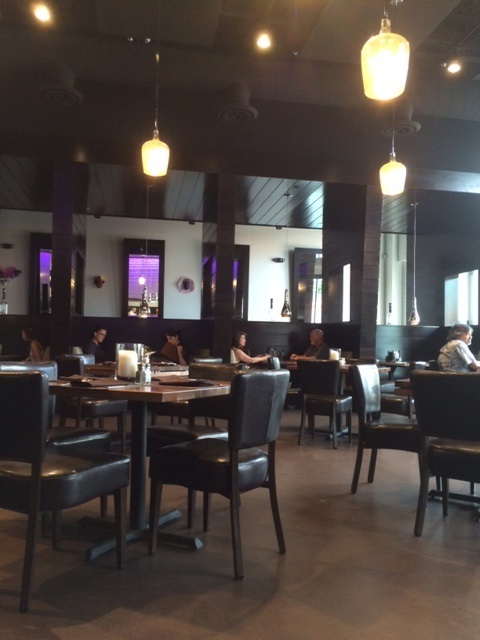 I checked out the restaurant recently at lunchtime with friends. 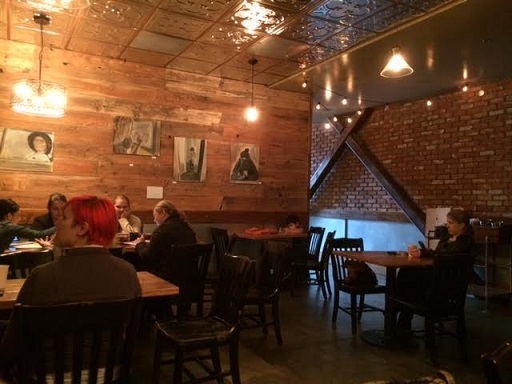 There’s a faux brick exterior, a high ceiling with exposed duct work, tables and booths and a few outdoor tables. You take a menu and line up to order, then move down the line to pay and collect your food at the end. 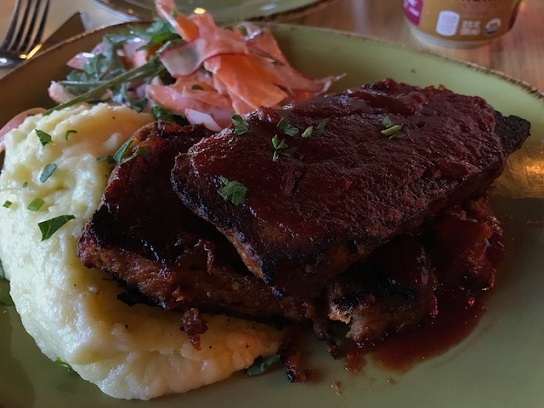 They have salads, which you can build to order, sandwiches such as tri-tip, chicken, reuben, cheese steak and club, plates such as tri-tip (a specialty), chicken or turkey, and beer and wine. 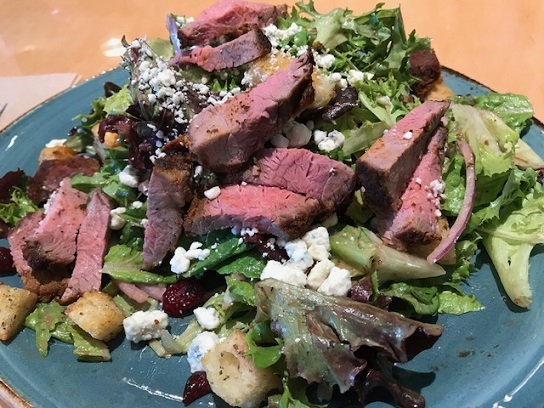 I got the steak salad ($11.75), with tri-tip, mixed greens, cranberries and bleu cheese. I liked it. Someone else was set on one item but impulsively ordered a summer special item, the Hawaiian chicken sandwich ($9.50). I would describe it, but I forgot to ask what was on it. Odds are good that pineapple and teriyaki were involved. He said: “Delicious. 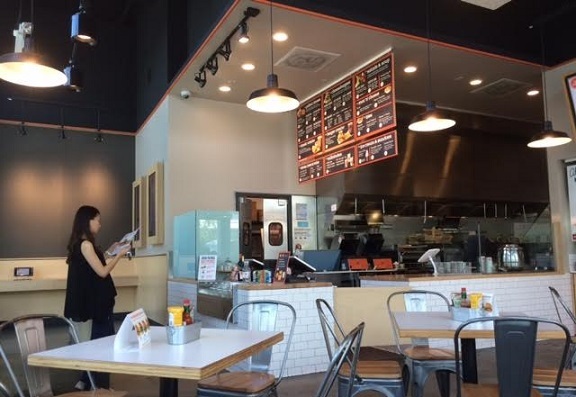 I want to come back and try one of their regular menu items.” His wife has had their banh mi and loved that. Our second friend, a vegan on a repeat visit, ordered the grilled portabella sandwich ($9.75), with a mushroom, sprouts, tomato and grilled onion on a ciabatta roll, holding the provolone. “Second time I’ve had it. Still good,” she said. So noted. Our only complaint was that at the height of the lunch rush, the restaurant was noisy with not just conversation but music. As people cleared out, talking became more comfortable. You’re too urban, Jack! I kept thinking of Tender Greens, a similar but better cafeteria chain that hasn’t ventured east of Pasadena. Probably we’re not yet worthy. Nothing wrong with Jack’s, though. 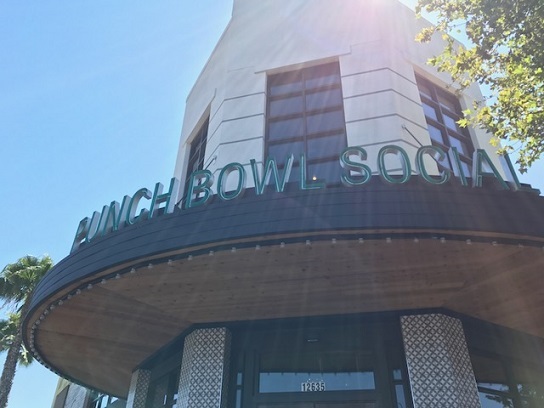 The Denver-based Punch Bowl Social opened at Victoria Gardens in May in the vast former Toby Keith’s space with an entertainment zone and restaurant. There’s casual bowling (pins held in place by overhead strings), karaoke, arcade games and more. The dining, though, is of interest, with a menu by “Top Chef” judge Hugh Acheson, and the dining area evokes a ’50s diner. Is it any surprise I’ve tried it out? 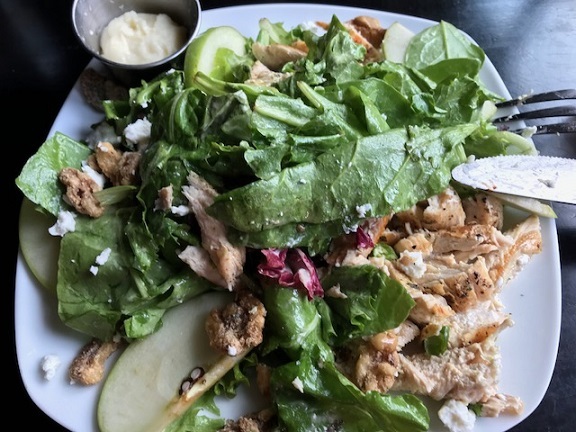 The menu has breakfast, brunch, sandwiches, salads and Southern specialties including fried balogna sandwiches, pimiento cheese and chicken biscuits, but you’ll see “grass fed” and “hormone free” at various points, and these are obviously upscale takes on the food. 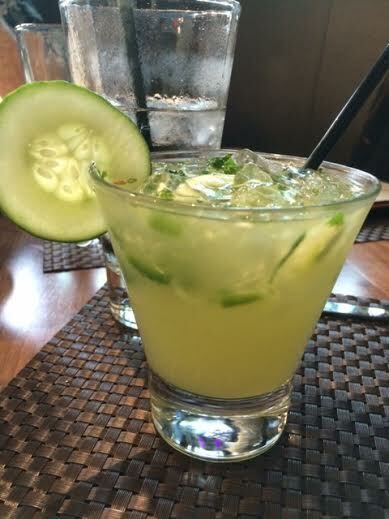 There’s also a long beverage list, from beer and mixed drinks to “adult” milkshakes. I was there for a late breakfast in May. 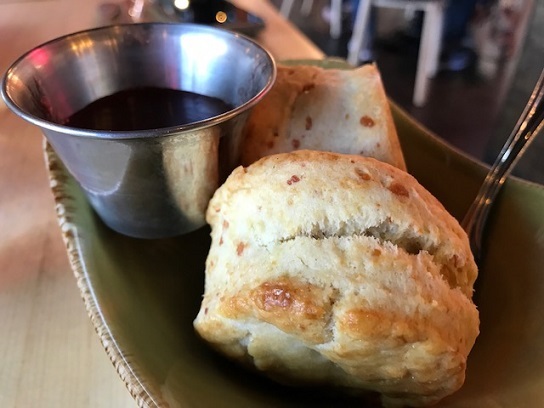 First they give you a biscuit and housemade jam, maybe the strawberry ginger. 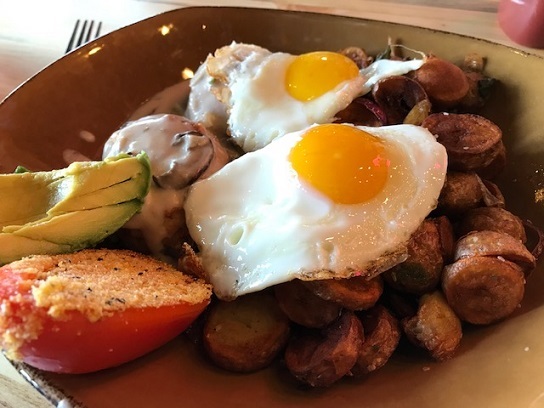 I ordered the mushroom biscuit and gravy ($11), which came with a couple of eggs atop potatoes. I liked it.. In July, I returned with another friend for lunch. She got the A La Bama chicken sandwich ($13) and a grapefruit soda ($5), while I had the meatloaf ($13) and a black cherry soda ($3.50). She liked her sandwich. Checking my notes, I have this direct quote: “It was good.” OK, that’s not that helpful. But her sociopolitical message is a winner. My meatloaf was a chef’s take on the humble dish, served atop mashed potatoes and with pickled radishes and carrots, all tasty and all probably better than your mom’s. 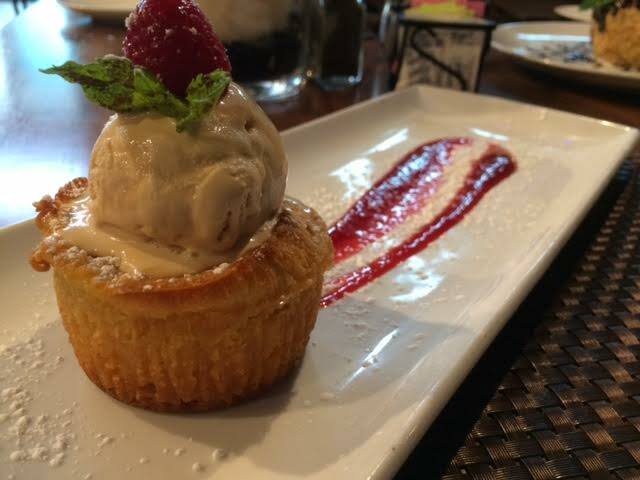 We should have tried the pie or another dessert, but after all that food, that wasn’t possible. The $40 lunch tab provided further discouragement. 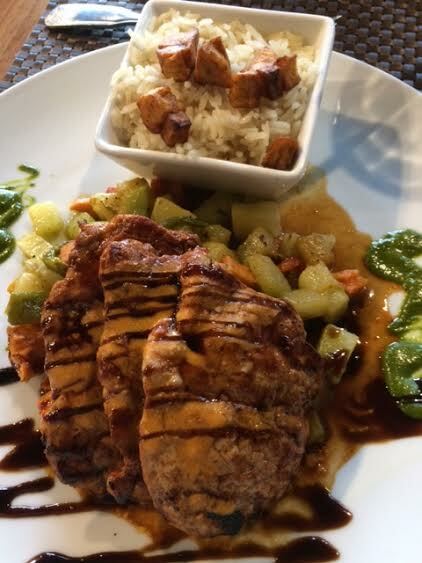 Stunningly, perhaps, Punch Bowl Social instantly became one of Rancho Cucamonga’s better restaurants. It certainly beat the similar but generic Big Al’s in Ontario. Be prepared to pay a little extra, and consider working off some calories through bowling. 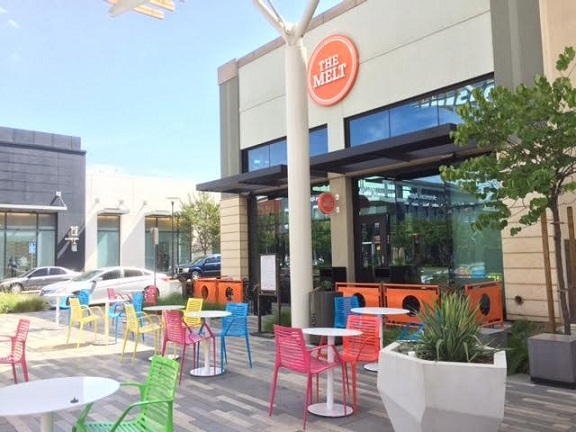 The Melt is a San Francisco-based burger chain with a small number of locations in California and Colorado. I’d eaten once at the Sunset and Vine restaurant and was only barely conversant with it before one opened earlier this year at Victoria Gardens. 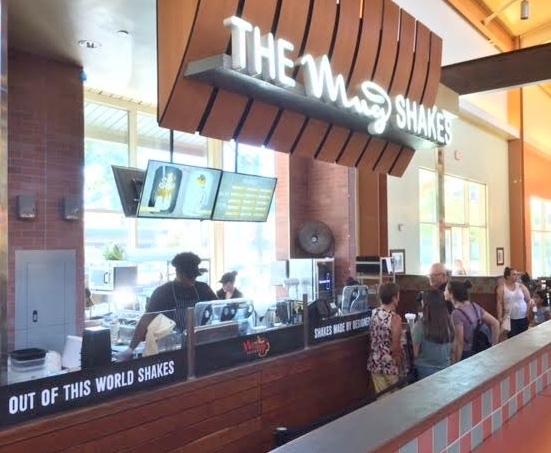 The menu has burgers, grilled cheese, two salads, tomato soup and mac ‘n’ cheese, plus milkshakes and all-natural sodas. The corporate ethos is to use better ingredients and no preservatives. They also serve craft beer and wine. 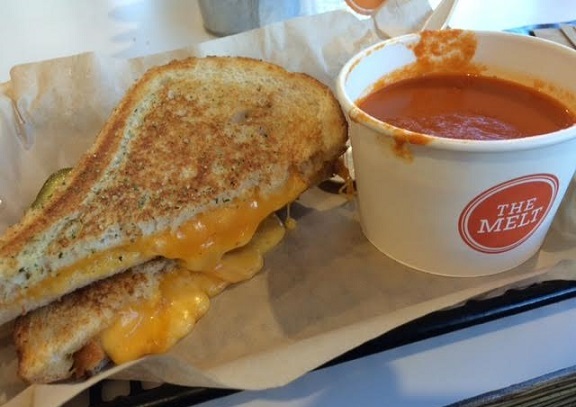 On my first visit I ordered the grilled cheese and tomato soup combo ($10) and got a black cherry soda. It was a warming, basic meal. Frankly, it was forgettable, but pleasantly so. I wanted to return sometime for a milkshake after trying the overdone version at The Mug Shakes. 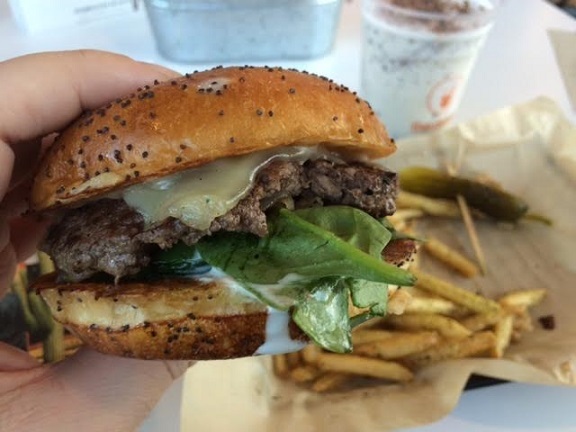 On my second visit, then, I got the swiss and shrooms burger ($7) with fries ($2.45) and a mint chocolate chip shake ($5). Other choices were vanilla bean, double chocolate, cookies and cream, snickerdoodle (!) and salted caramel. Very good burger, which came with grilled onions and greens, on a poppyseed bun, and the fries, sprinkled with oregano, were addictive. The shake had a crumbled cookie, like a Thin Mint, on top and I liked it too. A couple of small tables stand outside the restaurant, beyond which is more of a communal patio with chairs in cheerful primary colors. 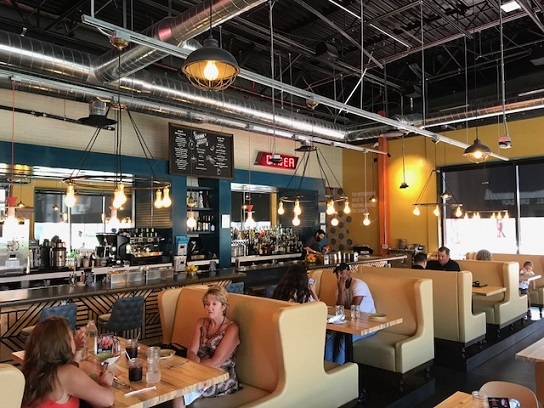 The restaurant is along the made-over street for youngish people with outdoor seating, stylized crosswalks and sidewalks, and overhead strings of lights. I like it. The Mug Shakes, which opened in May, is a locally owned stall in the Victoria Gardens Food Hall, a non-chain that could become one. 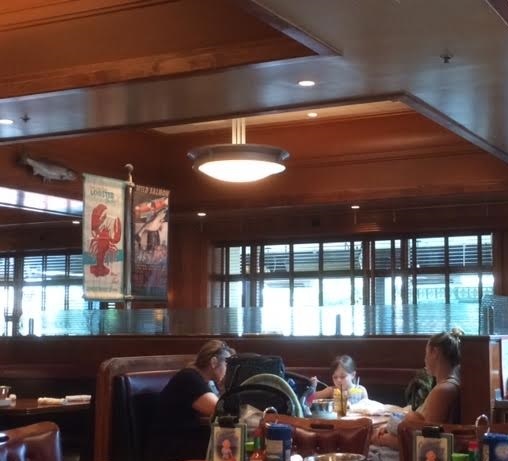 It created a sensation upon opening with its decadent creations that are served in glass mugs and spill out of them, with long lines reported on weekends. My colleague Neil Nisperos wrote about them. Fox 11 did a feature too. As is often the case with me, I was curious but didn’t act on my curiosity for a while; it’s not often I’m at Victoria Gardens, and the messy look of the shakes was a little off-putting, even while it might draw in others. I kind of forgot the place was there. And then a friend from North Hollywood visited and posted photos, and, shamed, I made a special trip on a lunch break this week, when the mercury was 100. After lunch, I went to The Mug Shakes, where only a couple of parties were in line. 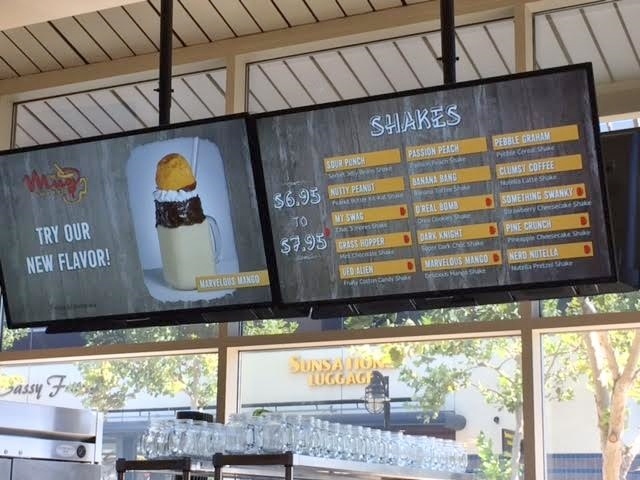 I had time to read the menu board, where photos of the shakes scroll by. A few sounded enticing for my tastes: the Nutty Peanut, with peanut butter and Kit-Kats, the Pine Crunch, with pineapple cheesecake, the O’Real Bomb, with Oreo cookies, and the Grasshopper, with mint chocolate chip ice cream. Some shakes are $7 while others are $8, presumably due to ingredients or assembly time, as all are the same size. I went for the Banana Bang ($7), with bananas and toffee, in part because it seemed like a (very relatively) lighter offering, and somewhat tidy. It arrived about five minutes later. There were banana chips affixed to the rim and, inside, fresh banana pieces amid the ice cream, plus smears of toffee inside and around the rim and a topping that some say is marshmallow cream rather than whipped cream. 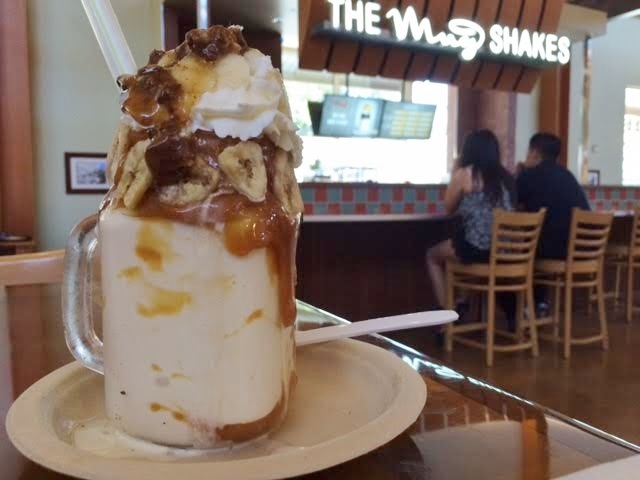 Two could share one of these shakes. The elaborate, spillover presentation is eye-catching, if not all that appealing to me. What surprised me was that the shake wasn’t made with premium ice cream. I expected more after all the hype and the care spent on the appearance. Overall, my shake was very sweet but didn’t taste that great. It felt like wasted calories. Toppings may not impress either: The few, lonely naysayers on Yelp, where Mug Shakes currently has a 4.5 rating, point out that the brownies in one shake are the processed Fiber One brand, not fresh-baked. If they’re going to go to this much trouble, why not use better ingredients and charge another $2 or $3? You can take the mug home if you like — the staff will give you a plastic bag for it, since it will be goopy outside and in — or you can return it, which I did. Would I ever go again? Ehh, probably not. 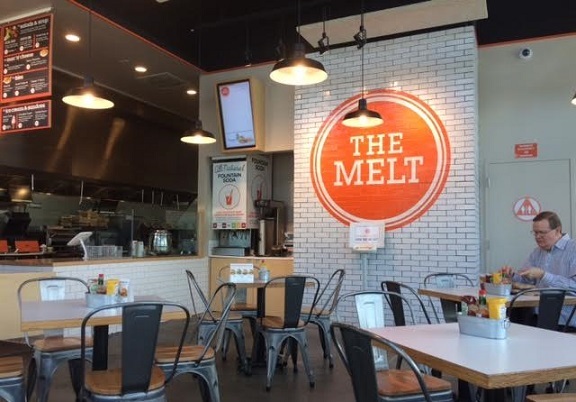 At the VG, you might get a better, and certainly more conventional, shake at The Melt (six flavors, including Snickerdoodle) or Johnny Rockets. 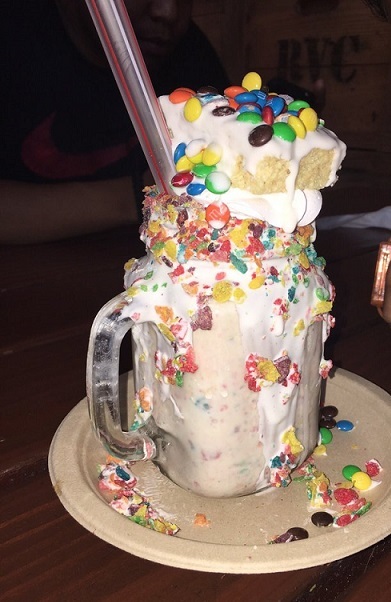 Below is a photo from Yelp of a more typical Mug Shakes offering, the Pebble Graham (I think), that may strike you as either challenging or disgusting. I report, you decide. One of the few one-of-a-kind shops in the Victoria Gardens mall, locally owned N7 sells ice cream, baked goods and coffee. 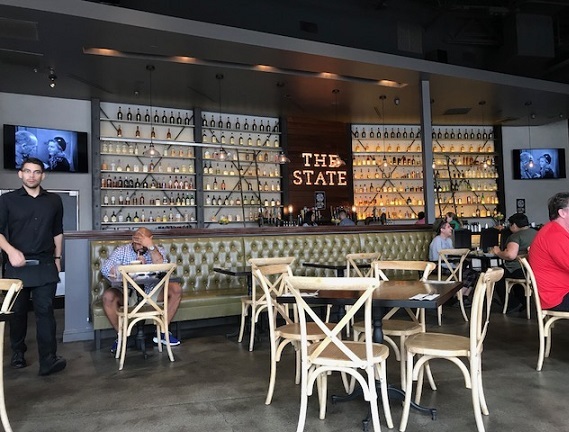 Open until 10 p.m. most nights and 11 p.m. on weekends, it’s a personality-plus environment: a high ceiling that looks like pressed tin, faux brick walls, distressed wood and local art on the walls. 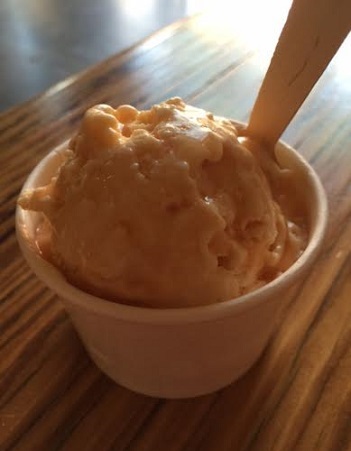 The menu shows the type of offerings: Stumptown coffee, nitrogen ice cream, baked treats, even if some, such as the flavors of ice creams, change frequently. I’ve been to N7 a few times and have always been impressed. Not a coffee drinker, I’m afraid, but if you are, you’ll find them suitably serious about the whole thing. 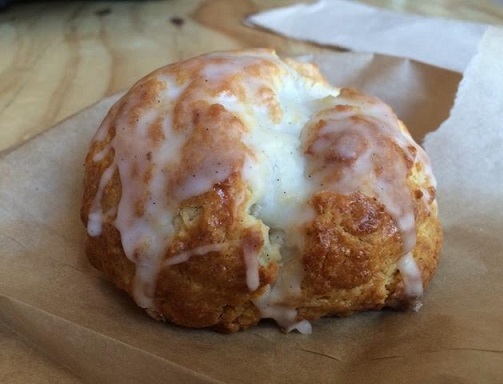 What I’ve tried is a scone ($3.75, above), cinnamon roll ($4.50) and a hazelnut hand pie ($5), in visits earlier this year, all three delicious and clearly made with care. They make it in front of you, although the setup isn’t designed to show it off the way it is at some nitrogen specialty shops. Prices are $6 for 4 oz., $7 for 6 oz. and $9 for 8 oz. When I had the ice cream, months ago, it was $1.75 cheaper all around; I didn’t blanch at $4.25 for a scoop, but I might at $6. 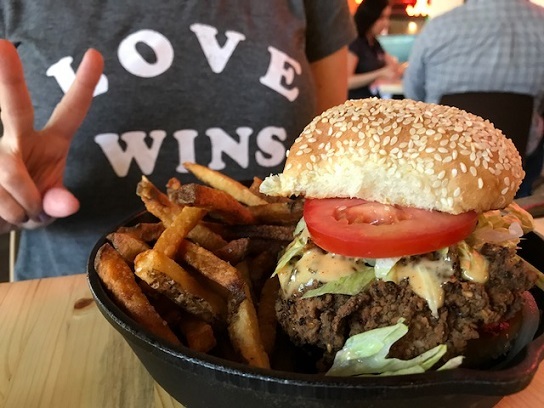 In everything they do, they emphasize quality ingredients from local, organic and/or sustainable sources, and a ban on preservatives, a stance that boosts the prices, perhaps, but shows they care. In the back, there’s a lounge with more seating, plus a bookcase with a scattering of reading material. It’s a cozy place to hang out or study. 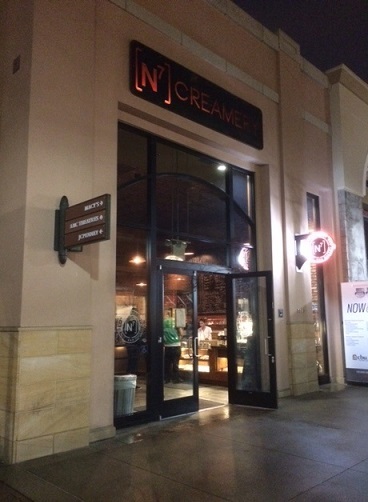 Basically, this is one of Rancho Cucamonga’s most unique, hand-crafted places, and it’s tucked away in a mall. That’s about as quintessentially Cucamonga as you can get. Give ’em a try. They deserve your support. 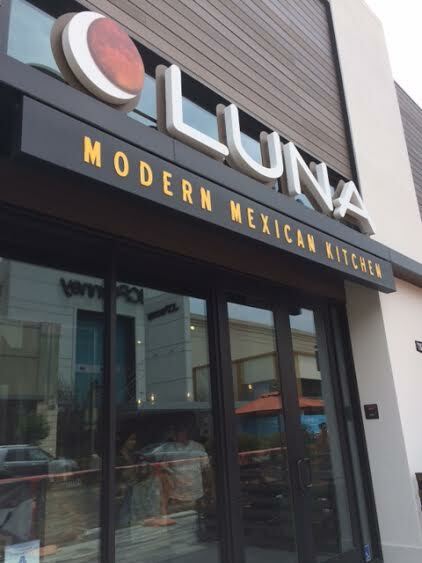 Luna opened in April in a long-vacant spot previously occupied by Candelas and Wapango. There’s only one other Luna, in Corona. Some friends and I checked out the VG version recently for lunch. 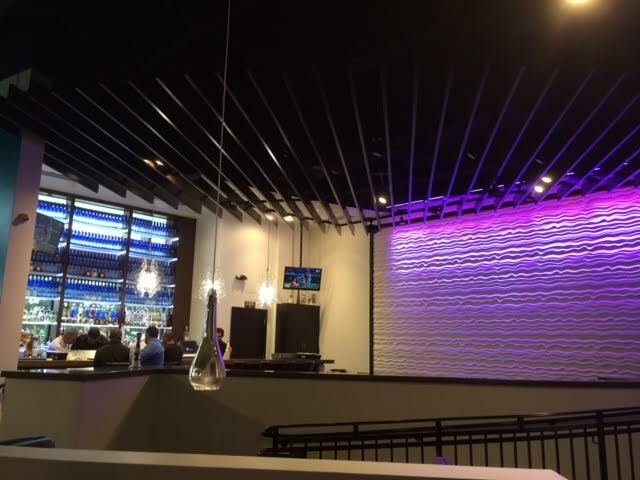 It’s very stylish, with high ceilings, long corded fixtures and a light display in the bar area. We were seated in a half-oval banquette. I have to do this from memory because I can’t find my notes (! 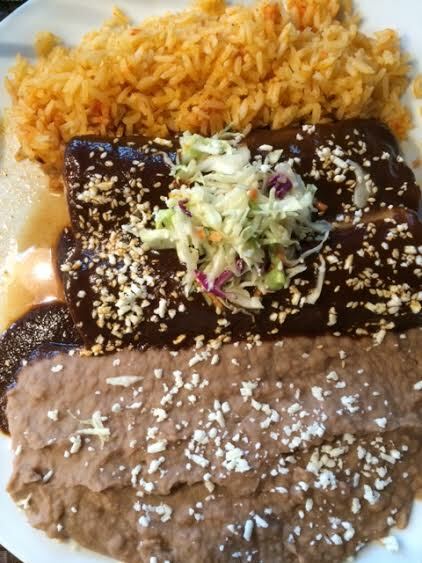 ), but off the lunch menu, we ordered (pictured in descending order below) a chopped salad, a Cabo roll (prawns, cheese, avocado in a tortilla), mole poblano chicken enchiladas and, for me, the pipian de puerco (pork loin in chimichuri sauce). (None of the prices are online, but the plates were around $12 to $18.) 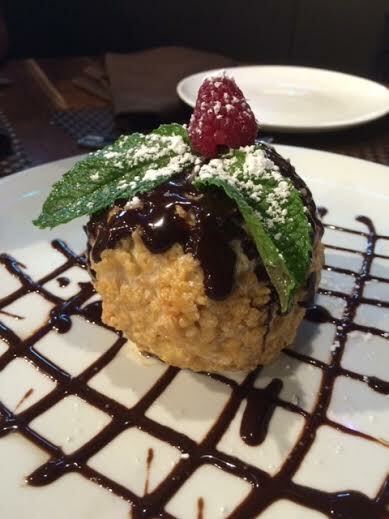 One got a drink, Luna’s signature, named El Pepino (about $8), from the extensive tequila list, and two of us ordered dessert: warm butter cake and deep-fried ice cream. 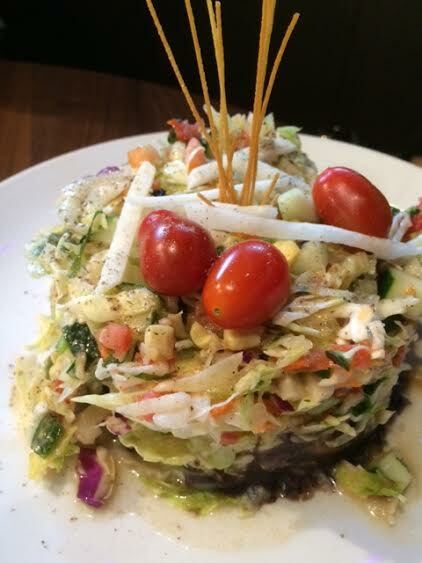 We all liked our items, and the friend who got the salad couldn’t help but be impressed by the presentation, a hat-like oval. All the dishes were plated well. Service was attentive and helpful and felt genuine. 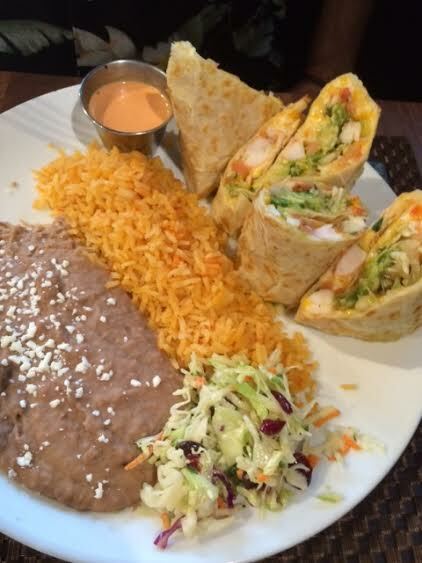 You can get tacos or burritos here, but Luna is more of a modern, upscale take on Mexican cooking that presents new or altered dishes. It’s worth a try. An editor owed me lunch recently after losing a work bet and, wanting to pinch his wallet a little but not too much, I chose King’s. 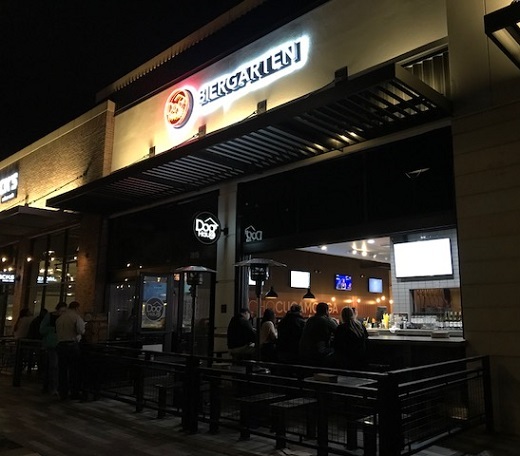 It’s in a prominent place, on the corner where many turn for the parking garage, and there’s plenty of seating, including a bar and a covered patio. The interior looks the same as I remember it, vaguely Art Deco. They were having a lobster promotion and a salmon promotion too. 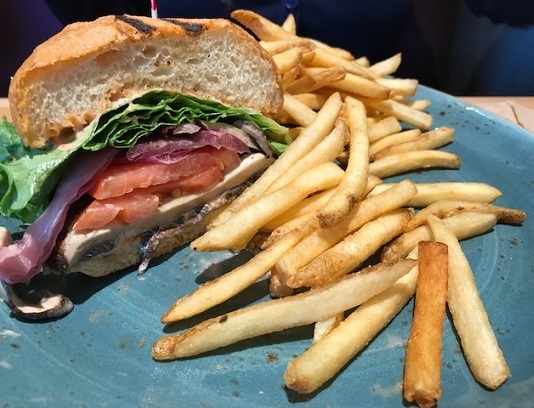 The menu has grilled seafood, a few sandwiches, salads and small plates, an oyster bar and even sushi, with lunch entrees running $14 to $24, dinner up to $30. 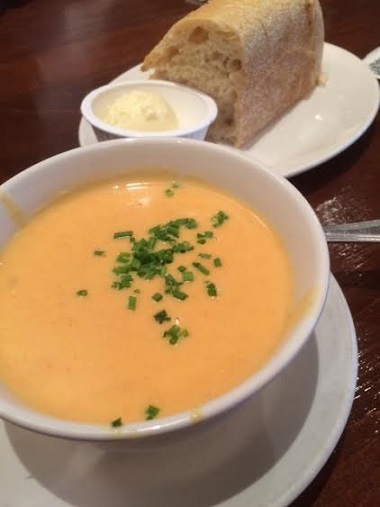 I got lobster bisque ($5.75) and cedar plank salmon ($21). 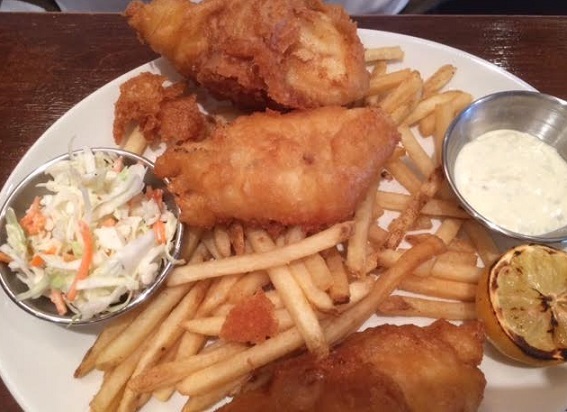 The friend buying my lunch opted for fish and chips ($16.50). He liked his dish. The bisque was a bit sweet, as the server had warned, due to cooking sherry (ooh la la). But it was fine. 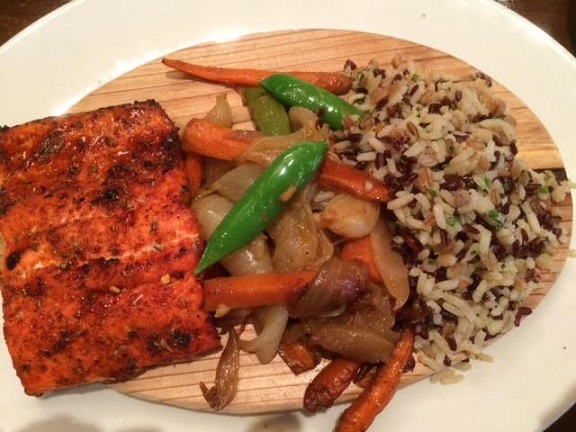 Ditto with the salmon, rice and veggies. The glaze wasn’t my favorite. But then, the whole lunch was all the sweeter because I wasn’t paying. Still, maybe I missed my chance by not getting filet mignon and lobster tail ($45) or at least dessert. I am merciful in victory. 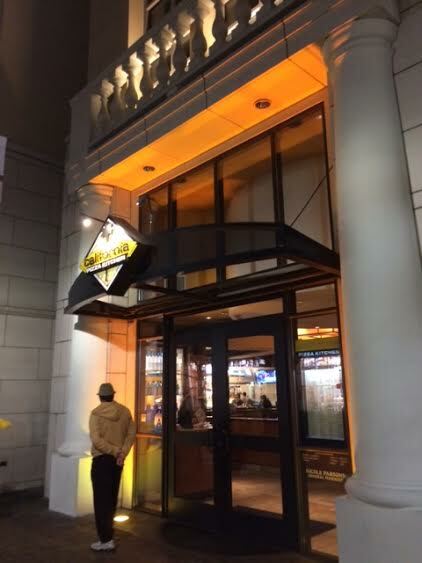 CPK was one of the original tenants at Victoria Gardens upon the center’s 2004 opening and more than a decade later, it’s still serving up barbecued chicken pizzas and more. I’ve eaten there a few times, in part because it’s one of the most affordable sit-down restaurant at the VG. Recently I had dinner there and figured, well, why not take photos and write a Restaurant of the Week? 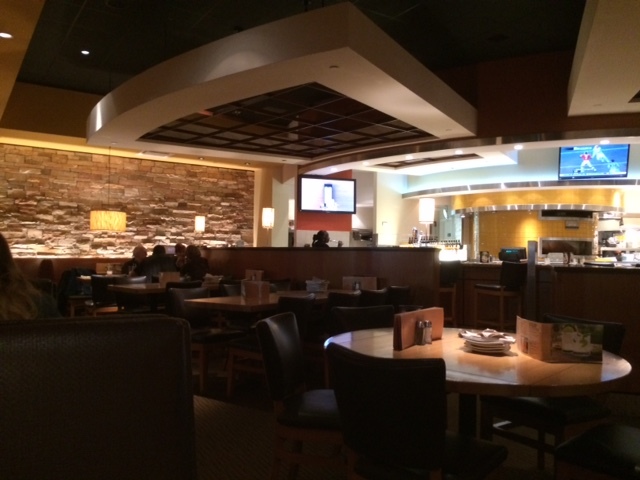 CPK is pretty much the same everywhere, but we’ve only got two of them (the other one is at the Shoppes at Chino Hills) and the VG is a popular spot. Besides, I like CPK. 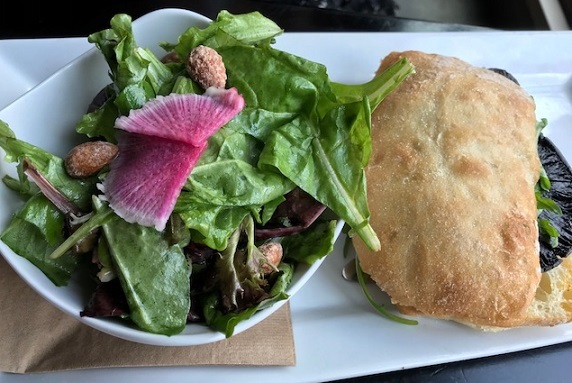 The menu has small plates, salads, soups, pastas and various pizzas, both usual and unusual, with gluten-free crust an option. And they have alcohol. I got the wild mushroom pizza (price forgotten, but about $14), which has four types of mushrooms and two types of cheese, and I got it on whole wheat crust, which I’m not sure I’ve done before. That was a good move and made for a heartier crust. If you like mushrooms, this is a pretty good pie. 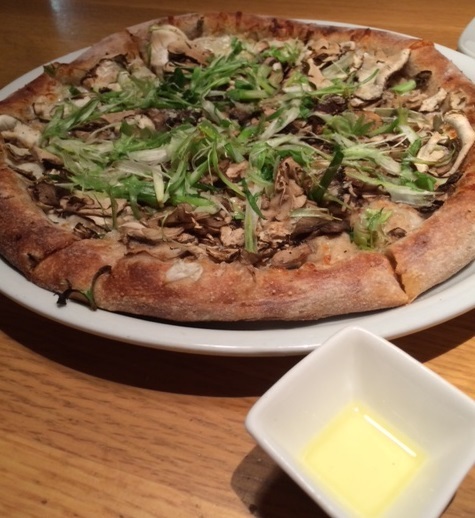 Feeling flush, I spent $1.50 on a few drops of truffle oil; to be honest, any difference in taste to the pizza was negligible. Service was friendly. It was a Monday evening, early, and the quiet was welcome. 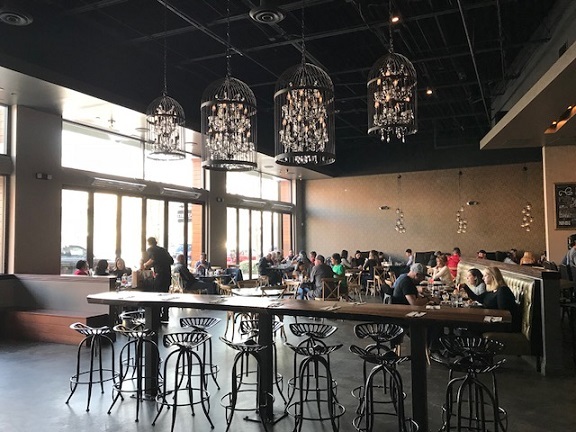 The faux rock wall, broad booths, focused lighting and open kitchen with a counter for solo diners add up to an ambience that could almost be described as swank.